Attend Embroidery Mart & Get Energized! Ready to make money (or more money) with apparel decoration equipment - embroidery, screen printing, digital garment printing, laser engraving, rhinestone setting, heat presses, sublimation? Embroidery Mart is the embroidery trade show for you! Online Registration will open soon for Embroidery Mart-ATLANTA! Registration for Embroidery Mart-NASHVILLE will open in late Spring, 2018. ALL attendees, including future embroiderers and apparel decorators MUST be at least 14 years old to enter the Exhibits or the classes. Attend Embroidery Mart & Get Recognized! Enroll in the NNEP's Professional Development Program. We know how to help you grow your business. !Become part of the National Network of Embroidery Professionals (NNEP) TODAY! NNEP is the only embroidery trade association in our industry founded and managed by experienced embroidery professionals. We’re the real deal. With decades of experience in our own embroidery business, we understand where you’re coming from and the issues you face daily as you run your dream business. As a NNEP member, you'll get industry-specific tips & secrets all year to help you succeed! © EmbroideryMart.com - All Rights Reserved. 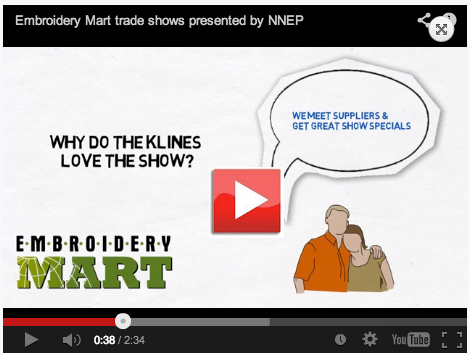 Embroidery Mart Trade Shows are presented by National Network of Embroidery Professionals (NNEP).